JERUSALEM, May 1 – Five young women from the ancient Chinese-Jewish community of Kaifeng, China, today fulfilled their dreams of formally returning to the Jewish people. Two years after Gao Yichen (“Weiwei”), 25, Yue Ting, 27, Li Jing, 30, Li Yuan, 29, and Li Chengjin (“Lulu”), 30, made Aliya in February 2016 via the Jerusalem-based nonprofit Shavei Israel, the five underwent formal conversion back to Judaism today in an emotional ceremony at the Jerusalem Rabbinical Court. They were all born and raised in Kaifeng, a city in the central Chinese province of Henan located southwest of Beijing, and are descendants of the once-thriving Jewish community that resided there for well over a millennium. “The Chinese Jews of Kaifeng are a living link between China and the Jewish people,” said Shavei Israel Founder and Chairman Michael Freund. “After centuries of assimilation, a growing number of the Chinese-Jewish descendants are returning to their roots and embracing their Jewish identity. 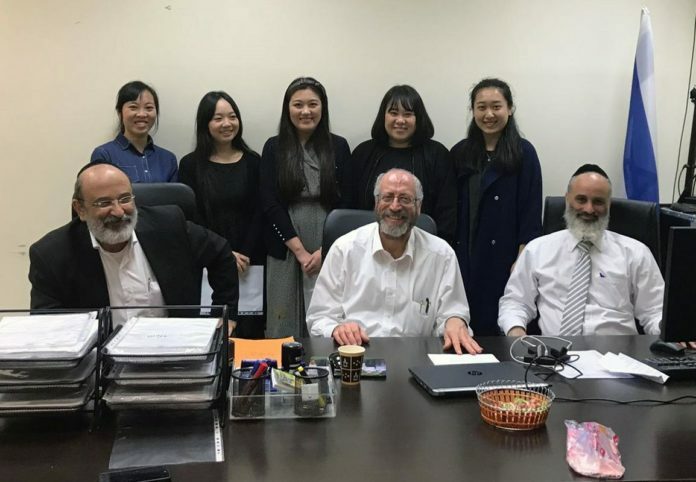 These five young women were determined to rejoin the Jewish people and we were delighted to help them realize their dreams.” In recent years, Freund noted, Shavei Israel has assisted nearly two dozen Chinese Jews to make Aliyah. While in Israel, the five Kaifeng Jews were supported by Shavei Israel, which covered their tuition and living expenses and arranged for them to study at Jerusalem’s Midreshet Nishmat – the Jeannie Schottenstein Center for Advanced Torah Study for Women. Shavei Israel will continue to assist the Kaifeng Jews with their integration into Israeli society. Photo Credits: Courtesy of Shavei Israel.